40:12 So when you find a mistake, what do you do? 40:17 You admit the mistake and you right the ship. 40:23 and we haven't righted the ship. 40:44 which actually has it's own issues. 40:49 what's going on in your arteries. 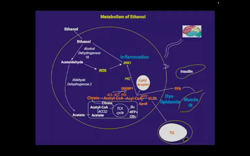 40:55 which is actually contribution to atherosclerosis. 41:01 it works in your arteries the same way. 41:04 And removal of fiber also. 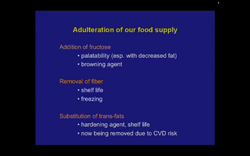 41:06 Now, why did we remove fiber from our diet? 41:14 used to consume 100 to 300 grams of fiber per day. 41:18 We now consume 12. 41:21 Why? What did we do? 41:24 We took the fiber out. 41:26 So, why'd we take the fiber out? 41:30 takes too long to eat, and shelf life. 41:33 So, people ask me, "What's the definition of fast food." 41:44 that has more than one gram of fiber in it. 41:47 'Cause there isn't any, and that's on purpose. 41:58 causes it's own satiety issues. 41:59 Bottom line, we have a typhoon on our hands. 42:10 because we know that those are a problem. 42:14 not completely, but most. 42:18 over the last 30 years. 42:21 Now, to the biochemistry. 42:23 Now, how many of you here have taken biochemistry? 42:43 you will have an anaphylactic reaction. 42:48 you will fall asleep. 42:55 at least it works, and just count the arrows. 42:59 You can do that, right? 43:00 Can you count the arrows, it's not like counting sheep. 43:03 Okay, you can count the arrows, and just stick with me. 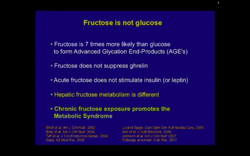 43:07 and let me show you why fructose is not glucose. 43:14 understand it to understand everything I've just told you. 43:21 more likely than glucose to do that browning reaction. 43:24 The advanced glycation end-products. 43:26 The thing that happens on your grill, 43:28 happens in your arteries for the same reason. 43:32 the color change too. 43:33 Fructose does not suppress the hunger hormone. 43:37 called ghrelin you've heard about, already. 43:47 do they eat more, or do they eat less? 43:52 They just took on 150 calories, yet they eat more. 43:58 the hunger hormone ghrelin, so they eat more. 44:12 that makes insulin, so the insulin doesn't go up. 44:18 see that you ate something. 44:20 Therefor, you eat more. 44:28 fructose and glucose, completely different. 44:40 we call the metabolic syndrome. 44:41 Everybody knows what the metabolic syndrome is? 44:54 hypertension, and cardiovascular disease. 44:57 Those all cluster together, called metabolic syndrome. 45:02 I'm gonna show you how fructose does every one of those. 45:10 will be glaringly apparent. 45:12 So, let's consume 120 calories in glucose. 45:17 Two slices of white bread. 45:19 What happens to that 120 calories? 45:26 of the total will be used by all the organs in the body. 45:30 80% off the table. 45:33 Because every cell in the body can use glucose. 45:41 can use glucose, because glucose is the energy of life. 45:45 That's what we were supposed to eat. 45:48 24 of those calories, or 20% will hit the liver. 45:52 So let's watch what happens to those 24 calories. 46:07 called IRS-1, insulin receptor substrate 1. 46:10 That's not important right now, don't worry. 46:11 And it's gonna tyrosine phosphorylate it. 46:16 which is now active, that's active. 46:19 messenger here called AKT. 46:21 Now what AKT does is, it stimulates this guy down here. 46:24 SRABP1, sterol receptor binding protein number 1. 46:29 Don't worry about it. 46:31 gets fat mechanics going. 46:34 So, you 'll see in a minute. 46:40 which takes glucose to glucose 6 phosphate. 46:43 Now, glucose 6-phosphate can't get out of the liver. 46:47 out of the liver is with hormones. 46:49 Glucagon or epinephrine, that's the way it can get it out. 46:55 so it's not a big bolus of it. 47:02 going over here to something called glycagen. 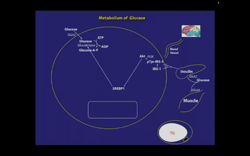 47:05 Now, glycagen is the storage form of glucose in the liver. 47:12 with glucagon and epinephrine. 47:20 before it gets sick? 47:24 The answer's any amount. 47:28 We have carb loaders who run marathons, right? 47:33 Does it hurt them at all? 47:41 or von Gierke disease. 47:43 They got livers down to their knees their so big. 47:45 They're hypoglycemic like all get out 47:47 'cause they can't lift the glucose out of their liver. 47:49 But, they don't go into liver failure. 47:55 form of glucose in the liver. 47:59 is to replete your glycagen. 48:01 So, this is good, this is not bad, this is good. 48:09 to this stuff here, called pyruvate. 48:12 enter your mitochondria, over here. 48:15 the parts of your cell that actually burn the energy. 48:18 They're your little factories. 48:19 They make the stuff that lets you live. 48:25 that's the energy of life, right there. 48:35 ATP and carbon dioxide which you breath off. 48:37 So far, so good? 48:39 Have I snowed anybody yet? 48:43 I snowed one guy back there. 48:46 I'm doing my best. 48:48 this acetyl-CoA, gets burned off in the TCA cycle. 48:55 and so, some of it may exit as citrate. 49:00 through a process known as the citrate shuttle. 49:06 subservient into this SRABP1. 49:11 carboxylase fatty acid synthase. 49:15 enzymes together turn sugar into fat. 49:25 This is denovo lipogenesis. 49:38 very low density lipoprotein. 49:41 Now, anybody heard of that before? 49:44 Is it good or bad? 49:46 It's bad, that's bad. 49:50 the things that causes heart disease. 49:52 It's also a substrate for obesity. 49:54 So, you don't wanna make much of this. 50:01 maybe a half a calorie will end up as VLDL. 50:12 can he die of a heart attack at age 90? 50:16 But that's not so bad. 50:18 If you make it to 90, you're doing alright. 50:20 Because that VLDL coming from glucose. 50:23 Glucose made a little bitty VLDL. 50:29 into your fat cell, here triglyceride. 50:34 your brain sees that signal. 50:39 to shut off further eating. 50:43 In other words, hey, I'm busy metabolizing my breakfast. 50:47 I don't need lunch. 50:57 in normal negative, yin yang energy balance. 51:02 This is good, this is not dangerous. 51:05 This is what's supposed to happen. 51:07 So now, let's talk about a different carbohydrate. 51:11 Let's talk about my favorite carbohydrate, maybe yours too. 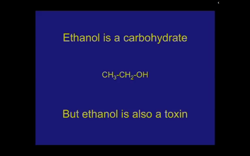 51:19Ethanol is a carbohydrate, isn't it? 51:26But, we all know that ethanol is a toxin, right? 51:34or you can fry your liver, your choice. 51:37Depends on how much you drink and how often. 51:45except, of course, a little bit is good for you. 51:48So, we can talk about that too, later, if you want. 51:50But, let's talk about how it's bad for you. 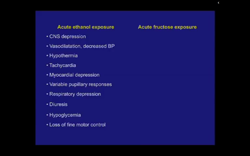 51:53So, here's acute ethanol exposure. 52:06you all went to college. 52:13It doesn't do any of those. 52:13Because the brain doesn't metabolize fructose. 52:19to cause all of those things, but fructose doesn't. 52:22So, fructose is not an acute toxin, ethanol is. 52:26We control ethanol, don't we? 52:30the Bureau of Alcohol Tobacco and Firearms. 52:33We have all sorts of things, we tax ethanol. 52:35We do all sorts of things to limit consumption of ethanol. 52:47so as to discourage consumption for public health reasons. 52:55to draw on, in terms of how to limit consumption. 53:01Because ethanol is a toxin, and we know it. 53:05So, let's consume 120 calories in ethanol. 53:15So, 24 calories right off the top. 53:24and kidney, muscle, brain will consume the other 10%. 53:28So there goes 20% or 24 calories right off the top. 53:3196 calories of the 120 are gonna hit the liver. 53:35Now, how many was it for glucose? 53:44This is a volume issue. 53:46We're gonna show you how. 53:51there's not receptor for it, not transporter. 53:55gets converted to this guy, over here, called acetaldehyde. 54:00Anybody know anything about aldehydes? 54:05Are aldehydes good for you or bad for you? 54:09'Cause what do they do? 54:13proteins is what they do. 54:17what do you think happens to it? 54:23So this guy, over here, is bad. 54:25And it generates something called reactive oxygen species. 54:28Reactive oxygen species damage proteins in the liver. 54:33the more of this stuff you get. 54:37So, this is one of the reasons why alcohol's bad. 54:46just like the pyruvate did before. 54:50just like before, to generate energy. 54:58they got energy, it's everything else they don't have. 55:00They're gonna have a whole lot of citrate. 55:07How many calories made it to the mitochondria with glucose? 55:15Because most of it went to glycogen. 55:20to show you that we're talking about big citrate now. 55:25all the way to VLDL by the CRABP1. 55:28And so you're gonna get a lot of the LDL. 55:29And this is the dyslipodemia of alcoholism, right here. 55:42that's not good for it. 55:52So insulin resistance, that's a bad thing. 55:54That makes your muscles and your liver now work so well. 55:58And can cause all sorts of other problems like diabetes. 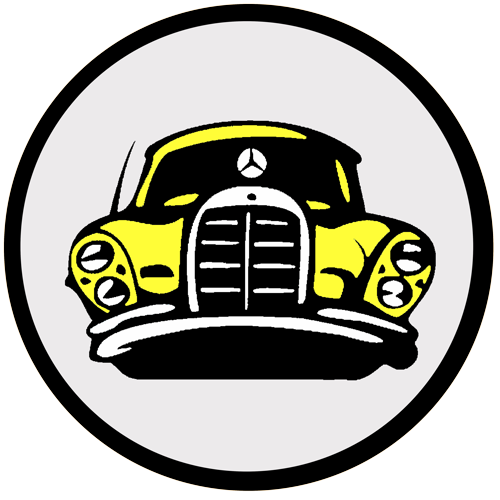 56:05so there's your alcoholic steatohepatitis. 56:14can start this enzyme activated. 56:32which I will show you when we talk about fructose. 56:35So let's talk about fructose. 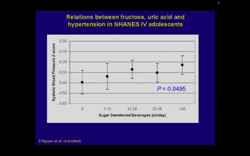 56:37Fructose is sweet, we like it a lot. 56:41we like it in our pretzels, we like it everywhere we look. 56:45So, let's consume 120 calories in sucrose. 56:50A glass of orange juice. 56:56a glass of orange juice, all the same 120 calories. 57:05Let's see what happens to the fructose. 57:12so 60 of the calories of the 120 are glucose. 57:1848 out here for the rest of the body. 57:20The same 20/80 split we had before with glucose. 57:27gonna be metabolized by the liver. 57:29Because only the liver can metabolize fructose. 57:40and in the process, generates various problems? 57:45What do we call that? 58:16had to come from somewhere, so it comes from here. 58:18Now, before we had 24 calories 58:21that had to be phosphorylated. 58:23Now we have 72 calories that have to be phosphorylated. 58:27So, we have three times the substrate, 58:29and there's the rub. 58:31It's a volume issue, for right now. 58:33So, we're gonna lose a lot of phosphate, aren't we? 58:35So there's a scavenger enzyme in your liver 58:37called AMP deaminase 1 to rescue 58:40the phosphates off the rest of the ATP molecule, 58:44and it takes ADP down to AMP, adenosine monophosphate, 58:47down to IMP, Inositol monophosphatase, 58:50and finally, to the waste product uric acid. 58:53Anybody every heard of uric acid? 58:56What is it? 58:59It's a waste product. 59:00Goes out in your urine. 59:17called endothelial nitric oxide synthase. 59:20And that's the enzyme that makes 59:21the stuff called nitric oxide, NO. 59:23And that is your endogenous blood pressure lowerer. 59:27That keeps your blood pressure low. 59:31So, when you can't make it, your blood pressure goes up. 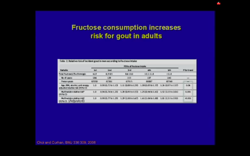 59:35So, this just shows that fructose consumption 59:37increases gout in adults. 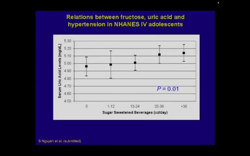 59:59in the adolescents, showing that sugar sweetened beverages, 60:02as it goes up, your uric acid goes up. 60:10and here's your systolic blood pressure going up.